We’d love your help. Let us know what’s wrong with this preview of Necromancer's Revenge by Emma Faragher. Mal is a necromancer: she can communicate with and even wake the dead. But not without sacrifice and now her greatest debt is being called in. Her skills are needed, and on a murder investigation no less. If only she'd actually done investigative work before. 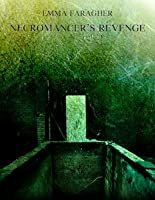 To ask other readers questions about Necromancer's Revenge, please sign up. The point for me in reading a short story or prequel novella is to take a few steps into this world to see if it is something that will grab me, pull me in and make me want to devour the next part or full novel. Sadly this did not happen. I went for this book because it sounded like an urban fantasy, my favourite genre. However it really read as more of a crime novel, a genre I don't enjoy. There was a lot of talk, very little action and not much of the paranormal. I didn't really get any sense o The point for me in reading a short story or prequel novella is to take a few steps into this world to see if it is something that will grab me, pull me in and make me want to devour the next part or full novel. Sadly this did not happen. I went for this book because it sounded like an urban fantasy, my favourite genre. However it really read as more of a crime novel, a genre I don't enjoy. There was a lot of talk, very little action and not much of the paranormal. I didn't really get any sense of Mal as a character or where the book was going to go later in the series. It didn't grip or excite and even Mal's unique character traits did not make me want to continue any further. This was a good prequel that was quick to read and simple to follow. It has intrigued me and I want to know more about the characters and their story--the premise and paranormal aspects are interesting. I look forward to seeing how everything develops and the prequel ties in with the full-length novel. This is a really cool and interesting story combining crime with the supernatural. It's fast-paced and tense and should keep you on the edge of your seat! It's a nice introduction to the world I'm looking forward to learning more about in Faragher's novel 'The House'. Recommended to fans of urban fantasy. I'm not sure which is the first but this one is just as interesting. More details about Mal and Ali. It sounds like Mal is going to be getting herself in lots of trouble which is making for an interesting series. I am currently a student at Sheffield university and I balance my time between studying and writing. I also play the flute and the violin, although time for practice is hard to come by. I started writing at 16 and never stopped, it keeps me sane. The House is my first published work. Although I'm working on editing my first book The Immortals' Fire to get that published as well.